Huanchaco is a stunning vacation beach town 12 km from the the city of Trujillo. Huanchaco is well known for its delicious seafood such as ceviche, intricately woven totora weed canoes and excellent surf culture. In 2012, Huanchaco was approved as a World Surfing Reserve. The original population of Huanchaco was local fishermen who worshiped both the moon and a large golden fish called Huaca Taska. It is widely believed among the people of Huanchaco that the name ‘Huanchaco’ came from a Quechua word meaning ‘beautiful lake’. During the time of the Chimu civilisation, Huanchaco was the port for the major city, Chan Chan, 4 km away. Built around 13,000 AD, Chan Chan was once the largest city in the Americas, covering 20 sq km. 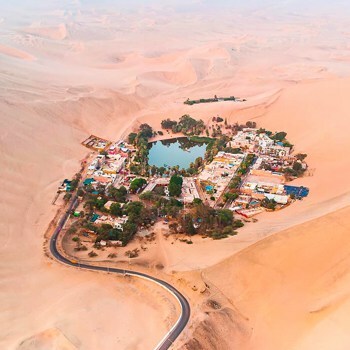 While it was definitely one of the most impressive structures of its time, harsh El Niño floods and heavy rainfall have eroded a huge amount of the outer parts of the city. Although much of the city is lost, you can still visit the restored Tschudi Citadel(complex), with impressive plazas, a royal burial chamber and intricate designs throughout. At the peak of the Chimu Empire, the capital Chan Chan housed approximately 60,000 inhabitants. At this time there was also huge amounts of gold, silver and ceramics. Even though the Incas conquered Chan Chan, this treasure still remained practically untouched until the Spanish conquistadors arrived. They looted the city and within a few decades gold dust was all that was left of what was once a monumental collection of wealth. In 1986, UNESCO recognised the ruins of Chan Chan as a World Heritage Site and since then, efforts have been made to preserve the site. Today, the Tschudi Citadel is the only one of nine citadels where the rooms and pathways can be roamed freely. While great efforts are being made in order to restore the site, it was made using adobe (a clay-like mixture of earth, sand and water). Adobe does not survive harsh winds and rains, therefore the ultimate demise of the once great city grows closer every day. A huge attraction that brings people from all over South America and the world to the beaches of Huanchaco is the excellent surfing that is on offer. From the morning, all through the day and into the evening, you can see both highly-experienced surfers and beginners. In Chicama, an area only 45 minutes from Huanchaco, you’ll find the world’s longest waves. 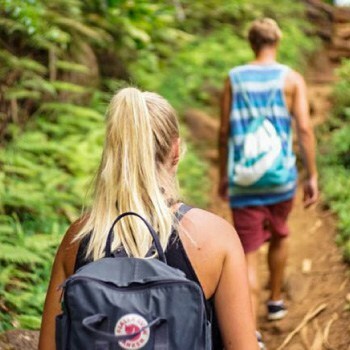 Many surf schools and hostels offer day trips to this area if requested. While possibly not as popular as its famous neighbour Máncora due to its cloudier weather, Huanchaco’s quiet beaches and quiet colonial backstreets have a certain special feel to it which has thousands of people re-visiting every year. It is widely believed in Peru that Huanchaco is the birthplace of surfing. Fishermen of Huanchaco have been riding the surf home after a long day of fishing for the last 2,000 years. Huanchaco is home to the Totora reed canoe, which is believed to have been used as the world’s first surfboards. 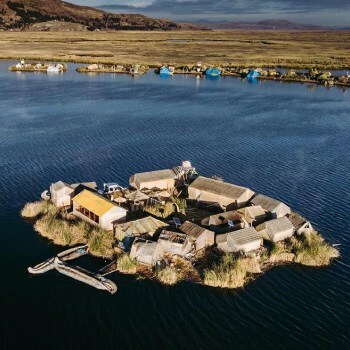 Totora reeds grow throughout different areas of South America, for example: around Lake Titicaca, around Easter Island and in the Huanchaco area. The boats created with totora reed are called balsas and they vary in size from small fishing canoes to thirty meters long. The Temples of the Sun and Moon were built over 700 years before Chan Chan, during the Moche period. The temples are located on the southbank of the Río Moche, approximately 10km southeast of trujillo. Although approximately one third of it has been washed away, Huaca del Sol is still the biggest pre-Columbian structure in Peru. It was constructed with around 140 million adobe bricks. Many of these bricks were marked with symbols which represented the workers that constructed the site. Unfortunately, today the structure has been reduced to a massive mound of bricks covered by sand. The Huaca del Sol is currently not open for visitation from the public as research on the site is still ongoing. Approximately 500m away lies the Huaca de la Luna. While it is smaller than its counterpart temple, Huaca de la Luna offers a wide range of rooms filled with ceramics, different varieties of metal and other artifacts. Information provided by mandatory guides includes: the daily lives of the Moche people, tales of warriors, evidence of human sacrifices and unconventional building practices. The most impressive attraction of the Huaca de la Luna is the mosaics. Having been well preserved under cover for centuries, their colors remain vivid to this day and are a truly beautiful sight to behold. Huanchaco’s reputation has been growing in the last number of years as one of the best seaside towns in Peru for food. There is a wide range of restaurants in Huanchaco, spanning from vegan restaurants to traditional Peruvian seafood options. This town has got the food to cater for both vegans and self-confessed foodies wanting to try some delicious local food. One of the main dishes served in Huanchaco and throughout Peru in general is ceviche. As one of the cornerstones of the Huanchaco, fish is a huge part of everyday life. As a result of this, there is access to fresh fish all year round. The main fish dish in Peru is Ceviche, a raw fish that is traditionally served in a garlic/lime/chili sauce with a range of vegetables such as onions, sweet potatoes and cassava (a Peruvian boiled root). According to Andrés Tinoco Rondan, an academic researcher at Ricardo Palma University, Huanchaco is the birthplace of the seafood dish, ceviche. As ceviche is made with raw fish, it is preferable to eat it as close to the sea as possible, making Huanchaco the perfect location to cook and serve this delicious traditional dish. As the culinary scene is greatly improving in Huanchaco, there are a wide range of restaurants to choose from. Below is our list of favourite restaurants in the area. If Peruvian fusion food is your thing, then look no further as this is the best in town. Don’t worry, if you just like the classics, they’ve got that too. Our favorite thing about this spot is that the menu varies from day to day depending on what the catch of the day is. The favored dish of this restaurant by locals is the ceviche. The ceviches are prepared either traditionally or with a fusion twist. Another very popular type of dish in this restaurant is steamed fish covered in a tangy, spicy sauce. This is one of those restaurants that will leave you going to bed dreaming about what you ate earlier that day. Not to be missed! In Big Ben, the staff believe that the mixture of gastronomy and culture can create incredible things. Big Ben is a family run business that has been operational since 1994. In Huanchaco, Big Ben has become an emblem of fish food and ceviche in particular. In Big Ben, the staff believe in creating a new, different experience every time that you enter the restaurant. The perfect spot for an evening meal with friends or family. Although this ‘restaurant’ is technically a hostel, the options are so diverse and delicious that it had to make our list. Moksha offers both vegan and vegetarian takes on traditionally Peruvian classics such as ceviche. Also available for purchase in this hostel is their deliciously home-baked bread, which we found impossible to pass up. The biggest highlight of the food offered in this hostel however, has to be the all-you-can-eat vegan sunday brunch for approximately 18 soles. Whether you’re vegan or not, you need to try out some of these wonderfully innovative dishes. The cuisine of Huanchaco has been greatly influenced by the history of the land and this can be seen through the traditional meals available here. 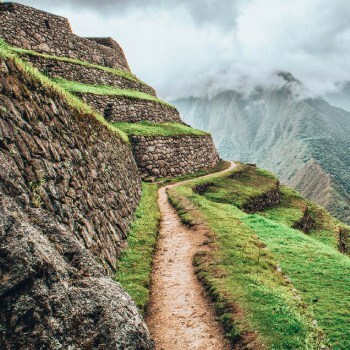 If you are interested in what food has been eaten in Peru for generations and which types have lasted throughout the years, then check out our blog Inca Food, Past and Present. Captain FAP Carlos Martínez de Pinillos International Airport is an airport serving both Trujillo (Peru’s third largest city) and Huanchaco. It acts as Peru’s main air hub in the north of the country. The airlines that serve this airport are: Avianca Peru, LATAM Peru, ATSA, LC Peru and Movil Air. The flights that are offered from this airport are only regional. 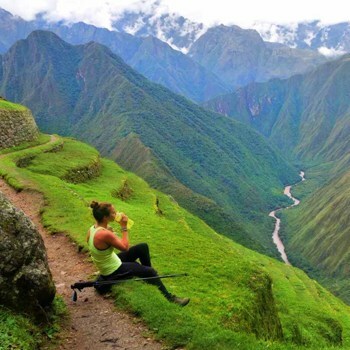 These include: Lima, Cusco, Iquitos and Chachapoyas. 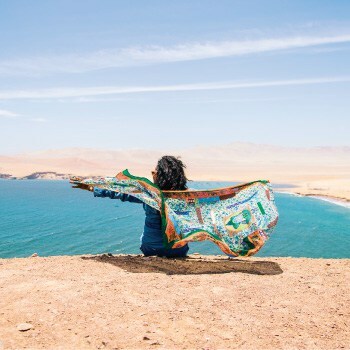 The flight from Lima to Trujillo airport is approximately 1 hour and 20 minutes long whereas the flight from Cusco to Trujillo is around 2 hours long. Once in Trujillo, Huanchaco is only a 20 minute bus journey away. Another mode of transport that can get you to Huanchaco is the bus. There is quite a wide range of buses that travel from Lima to Trujillo. These include: Ittsa Bus, Linea, Oltursa and Cruz del Sur. Once you have reached Trujillo, a public bus can be taken for 20 minutes to get to Huanchaco. The journey from Trujillo to Lima (or vice versa) is approximately 554 km and takes around 8 hours. As buses are cheaper that most other modes of transport, they are the most popular among travelers. 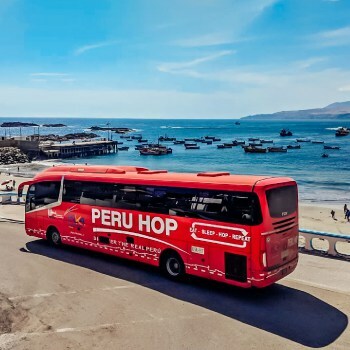 While all of the buses listed above are suitable ways to travel around the north of Peru, there are superior bus companies when you travel south beyond Lima. 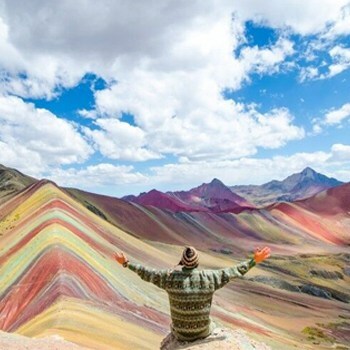 If you would like to learn more about the best bus companies to travel with in Peru, then click here. Now that you know how to get to Huanchaco, what to eat and what to see, you are fully prepared to relax by the ocean and eat like a local. Enjoy and safe travels! Huanchaco is rad! The surfing is up there with the best in South America and the restaurants are so awesome! I just wish I could have spend a few more weeks here. Visited Huanchaco last Summer for some surfing and I couldn’t recommend it enough! Regardless of your skill level the conditions and schools in Huanchaco make it the perfect place to take it up. I’m already counting down the days til I can go back!